MELVILLE, NEW YORK , April 12, 2017 (Newswire.com) – RingLead, Inc., a leader in data quality management, today announced advanced data enrichment capabilities in its end-to-end, cloud-based data solution, DMS. Designed to empower businesses with complete records of customers and buyers, DMS Data Enrichment provides businesses with firmographic and contact data ranging from verified email addresses, social links and phone numbers, to company size, location and SIC Codes. DMS Data Enrichment normalizes data and appends website URLs before layering on multiple data sources to yield an average match rate of 65-90%. For customers seeking an enhanced database without the work, RingLead’s custom data services include everything from an initial data cleanse and deduplication job, to email verification and record enhancement. Within DMS, users have the option to enable data enrichment for List Import, Web Submission and Marketo, authorizing the tool to append blank fields on records upon import. 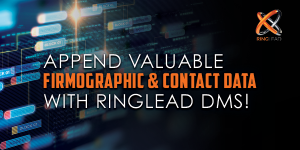 RingLead’s patented normalization and verification technology within DMS ensure all data remains campaign-ready at all times. Firmographic data generated in DMS enables businesses to maximize campaign potential by first building ideal customer profiles and segmented audiences based on factors like revenue, industry and company size. Firmographic data allows marketers to deliver tailored, highly-relevant messaging that results in lasting relationships with key influencers at prospect companies. While Firmographic Append adds data points to your leads and accounts, RingLead’s Contact Append tackles your leads and contacts to discover multiple channels of communication. Enriched contact data enables sales and marketing professionals to not only tailor messaging, but also to connect with the buyer on various platforms. Leveraging multiple data sources, DMS is able to yield nearly 20 unique social media platform links. Together, firmographic and contact data ensure that you reach the right titles, within the right industries and locations, at just the right time. For a free Firmographic Append on 500 records, visit us at ww2.ringlead.com/FreeFirmAppend.